Wisconsin Sports Tap: Wait, what? Am I the only one that missed the start of the NBA season? All of a sudden I'm seeing new scores in the ticker, reminding me that Oklahoma City has a professional sports team. That means the Bucks are back in action, and two games into 2009-10 they've at least won a game. So sitting at 1-1 with an ugly loss and an uninspiring victory, they've already taken their first blow of the season. Michael Redd is out for the next two weeks with a knee injury. The fact is this wasn't a very good team to begin with and Redd being out is like the poor getting poorer. Let me first apologize, but it's hard to get overly excited for the NBA even when the Bucks are good. So when they refuse to admit that they are rebuilding and sacrificing talent for cap space it does not inspire the fan base to shell out their hard-earned cash for tickets. 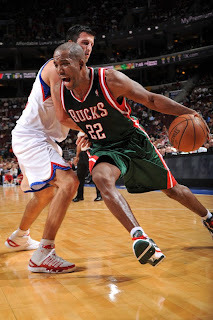 Michael Redd is coming off a major knee injury (torn ligaments) and has already aggravated the same knee. He represents the only consistent scorer the team has. So if he can't stay healthy the team will not win 30 games, and even if he stays healthy the team will still only win 35 games. The team declined to pick up the option for the third year of Joe Alexander's contract. Last year's first round pick, Alexander never made an impact on the club. The fact that the team is not pulling the trigger on year three is kind of like conceding that he is a bust of a draft pick. A player drafted 8th overall needs to have an impact, Alexander hasn't, and likely won't. Like it or not, there is no player more important to the advancement of this organization than Brandon Jennings. He is the future of the Bucks organization, and the do or die piece for General Manager John Hammond. If Jennings flares out, than Hammond will be out the door with him. Entertainment be damned. With a complete lack of scoring, this will not be a fun team to watch this season. Andrew Bogut is underwhelming offensively, and in my mind a very disappointing first overall draft pick. After Redd, the scoring will fall on Jennings and free agent Hakim Warrick, who is still known more for blocking a shot that sealed Carmelo Anthony's NCAA title at Syracuse than anything he's done in the NBA. This team has had trouble developing players. Maybe it's the scouting department, overestimating the potential of the players they've drafted. Maybe it's the coaches, unable to cultivate the talents of the team. But most likely it's the players, they just aren't that good. 2008 - 1st (8th Overall) - Joe Alexander - Bust, see above. 2008 - 2nd (37th) - Luc Richard Mbah a Moute - Solid defensive player, little to no offense though. 2007 - 1st (6th) - Yi Jianlian - This was a dumb pick, and everyone knew it. Since traded to New Jersey. 2007 - 2nd (56th) - Ramon Sessions - Above average point guard, inconsistent. Signed by Minnesota as a restricted free agent and the Bucks declined to match. 2006 - 2nd (39th) - David Noel - Who? Exactly. 2005 - 1st (1st) - Andrew Bogut - What a terrible year to end up with the first overall pick. Still, this could have been Chris Paul. Imagine how this team would look if that had happened. 2005 - 2nd (36th) - Ersan Ilyasova - No return yet, but this could be his year! (Probably not). 2003 - 1st (8th) - T.J. Ford - A career riddled with injuries, turns out he is too short to be an NBA point guard. 2003 - 2nd (35th) - Szymon Szewczyk - Again, Who? Has yet to play in the NBA. 2002 - 1st (13th) - Marcus Haislip - Project pick, never turned into anything. Now playing in Turkey. There you have it. Seven years worth of draft picks and only one of which is consistently starting for the Bucks. Now, current GM John Hammond has only made four picks. Alexander and Mbah a Moute on that list, and this year's rookies Jennings and Jodie Meeks (who hasn't seen the court in the first two games). Player development is important for a city that is not considered a free agent attraction, so Hammond has his work cut out for him. But as far the 2000-10 Bucks go, 35-40 wins and a low playoff seed is the optimistic outlook. The realistic? 25-30 wins and a return to the draft lottery. 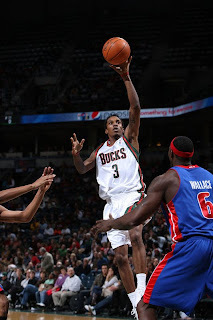 I didn't see the games, but it looks like Brandon Jennings has had a fantastic start to the season. If nothing else he should make for an interesting story to follow as the first high schooler who forwent college to play overseas before entering the draft. His performance could impact a whole generation of HS basketball players. Funny thing: after not caring about the NBA for I don't know how long, I'm actually somewhat interested in following the Bucks this year. And I think its because rooting for them is so safe. After reading SI's prediction that they'll finish dead last, my expectations can't be any lower, so there really is no disappointment factor. Its like taking a test you're supposed to fail--even a D+ feels pretty good.